RENT DIRECT FROM THE OWNERS AND SAVE!!! There's nothing more relaxing than sitting on the lanai watching the palm trees sway in the afternoon breeze while enjoying the fabulous ocean view; the swells breaking over the reef where green sea turtles play. October through April you can see the whales as they breach and teach their young, that’s right, whale watching is possible from the lanai! Located on the second floor, the Kauhale Makai (Village by the Sea) Resort includes a Sparkling Tile Pool, Hot Tub, and Kiddies Pool, these pools also have beautiful murals of whales and turtles. Putting green, shuffleboard, and volleyball court, as well as barbecue facilities are also on the grounds. Our guests are welcome to use the two public tennis courts located south of Kauhale Makai. Laundry facilities are on nearly every floor of the resort. In addition, a concierge next to the front quest for booking events and attractions. This condo is furnished with granite kitchen counters, electric appliances, tile flooring and bathroom separated from the lavatory; everything one would need for a 'home away from home. We lament sleeping on poor beds while on vacation, with visions of our bed back home. This is why we have a King-size 'Pillow Top bed manufactured by Custom Comfort Mattress Company in the bedroom. We are sure you will appreciate a good sleep while on vacation. In addition, should you tire of the ocean views, there is high-speed wireless internet for our guests to surf the web or access their e-mail through our WiFi router allowing you to connect your own laptop. The entire condo has been furnished and decorated with island furniture and art, and there is, CENTRAL AIR CONDITIONING! From the moment you walk through the door you will know you are in Paradise. Sorry, but no pets are allowed (resort rules). This is a NON-SMOKING unit. We have been coming to Hawaii several times each year during the past decade for business and thought; maybe we should invest in our retirement plan now. That was 2002 and we never looked back since. Maui continues to be the one place we can let our shoulders drop and let the tension of work and daily stresses melt away. Our children ask to come to Maui every chance they get. All seasons and through all weather conditions, we have found our sanctuary from the busy, stresses of everyday life. We hope you find our little piece of paradise as enjoyable as we do. 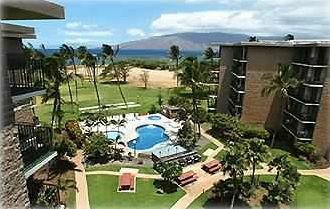 Maui is our favorite Hawaiian island, Molokai is probably the most serene, but too small to accommodate vacation renters. While on the mainland, we long for our morning ritual of a cup of coffee on the lanai; watching whales and the parade of boats making their way to Molokini for snorkeling trips. Every evening the sky is a tapestry of color as the sun sets and paints the clouds with the most vibrant colors and shapes as a backdrop to the palm trees keeping in rhythm with the island breeze. Tub with shower and water closet (Toilet) are separate from the Lavatory for privacy. Including beach towels and Kitchen towels. WIFI is included at no extra cost. We will include the login information in our Welcome Letter. Sorry we no longer provide a computer, as most guests bring their own. includes dish washing detergent for 3 loads with each stay. Energy Star rated 18 cubic foot with ice maker. We also have blue ice for our ice chest to take to the beach. Large 1100 watts with turntable. All new energy star appliances with granite counters. (2) Standard Cable in Master Bed and High Definition in Living Room. This library has grown. We have an unwritten policy of leave a book, take a book. So the titles are always changing. Shared Tennis courts with the Luana Kai next door. Tile Mural of Humpback Whale and Calf in main pool and Tile Mural of Honu (Turtle) in Keki (todler) pool. Putting Green and Shuffle Board in the central courtyard area. We thoroughly enjoyed our stay in this property. Definitely needs some updating, but we had everything we needed in the condo. Upon entry into the property, I was 99.9% sure I have stayed in this exact condo about 6 years prior, and not much had changed since then. Some new living room furniture possibly. It is a great value for folks no wanting to spend top dollar for a place to sleep and cook. The picture depicted is pretty much the view you have from the living room and the bedroom. The location was great, as it was near "Maui Pie", which actually may not have been a good thing!!!!!! I appreciated the location also as we were in Kihei on the opposite side of the Wailea end. It made it convenient to get to Wailuku, Lahaina, and Kahului. Owner appears to want to be as hands off as possible. We paid off the trip about 120 days prior to travel and did not hear back from him until a few weeks prior. Don't be alarmed, he will get back to you. Loved the location- walked on the beach in the morning with coffee, easy parking and stocked kitchen with everything you need. If you are arriving after check in hours be sure to reach out for access to the unit before you arrive. Overall, we enjoyed our stay in the unit. The best part is the full kitchen that is fully stocked with cooking utensils. There are plenty of beds if you have a large party, and tons of bedding. There is a closet with hangers, but only a small "dresser" to put clothes. The lanai is large and had a great view of the water, facing towards Lahaina and you can see part of Molokai. A nice breeze rolls through if you keep the doors open. The bad..right off the bat the floors were dirty. We had to purchase bleach and scrub them ourselves because our babys knees and hands were totally black. We had some issues with bugs as well, the place needs to be sprayed. The interior is old and worn, and it because more noticeable the longer you stay. There's more, but in the end the unit is a good enough home base, I just can't say we'd choose to stay in this unit again. Mahalo Nicholas, for your time reviewing our condo rental. We took May off the rental market for our most trusted on-island agent to stay-in and bring the unit back to its intended appeal. Our usual maintenance has fallen behind due to family health concerns; and our apologies for your experience. Beautiful location, but poorly maintained unit. Walls scratched and dented and in need of paint, badly stained love seat, pots and pans in poor condition, etc. Good location to shops and restaurants. Load construction happening during my visit I didn’t know about until I arrived. Sure this complex is repairing lanai's and painting the exterior of both buildings. This side of the building seems to be first. Fortunately, this unit has been has been completed. This condo was comfortable and clean. Fully outfitted and centrally located to enjoy Maui.